A Military presence in the vicinity of the current Station dates back to 1911 with a balloon squadron of the Royal Engineers setting up a training camp in Tentsmuir Forest, joined by the aircraft of the embryonic Royal Flying Corps. Like so many RAF stations, the airfield itself owes its existence to the hot stimulus of war, and work began on levelling the existing site on Reres Farm in 1916 with building still underway when the Armistice was signed in 1918. Most was made of the maritime location when it was designated a Naval Fleet Training School, eventually to undertake the training of ‘naval spotting’ crews who acted as the eyes for the Royal Navy’s capital ships. The unit was formally named Royal Air Force Leuchars in March 1920, but retained its strong naval links. As the Navy embraced the value of aviation, the aircraft carrier was added to its inventory. Many of the flights dedicated to Leuchars were attached to such vessels for months at a time, with light and dark blue uniforms mixing together. In 1935 Leuchars became home to Number 1 Flying Training School (No 1 FTS) and ranges for practice bombing were established in Tentsmuir Forest. When No 1 FTS moved to Netheravon, the Station came under the control of Coastal Command and in 1938, 224 and 233 Squadrons arrived to fulfil an operational role for the first time. Leuchars remained an active Station to the end of the War, concentrating on anti-submarine and anti-shipping strikes. With the contraction of the Air Force in peacetime, Leuchars hosted a school for general reconnaissance and the St Andrews University Air Squadron. In May 1950, Leuchars passed from Coastal to Fighter Command with the arrival of the jet age and 222 Squadron Meteors arrived. This generation of jet aircraft gave way to the Vampire, Javelin, Hunter, Lightning, Phantom, Tornado and Typhoon. In 1954 a flight of Sycamore helicopters for Search and Rescue duties arrived at RAF Leuchars, subsequently undertaken by the Whirlwind and then the Wessex and was a valuable adjunct to the civilian mountain and maritime rescue services. 2003 saw the Tornado F3 Conversion Unit (OCU), 56 (Reserve) Squadron operating from Leuchars, in 2008 56 (Reserve) Squadron amalgamated with 43 (Fighter) Squadron, then in 2009 43 (Fighter) Squadron was disbanded. In 2010 Number 6 Squadron, the first Typhoon fighter squadron in Scotland, stood up at RAF Leuchars. 2011 saw the disbandment of 111 (Fighter) Squadron, with 6 Sqn taking over responsibility for providing the northern element of Quick Reaction Alert Force. 1 (Fighter) Squadron officially re-formed in 2012 as the 4th front-line Unit to operate the Typhoon FGR4 multi-role combat aircraft working alongside 6 Sqn. 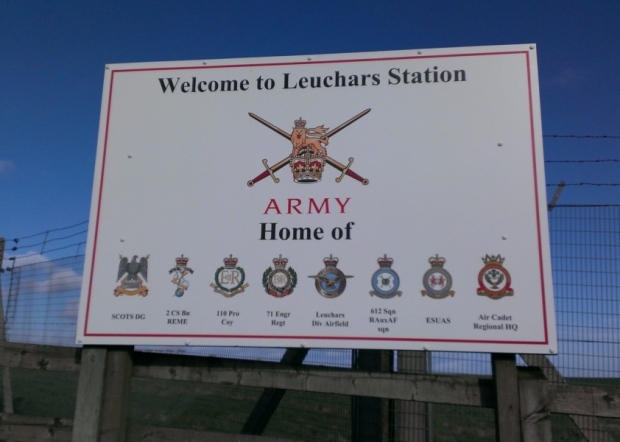 On 1st April 2015 RAF Leuchars transitioned to Army control and was re-named Leuchars Station. It has become home to the Royal Scots Dragoon Guards, 2 Close Support Battalion of the Royal Electrical and Mechanical Engineers, and 110 Provost Company of the Royal Military Police. They are working alongside 71 Engineer Regiment, Diversionary Airfield, East of Scotland University Air Squadron, 612 Squadron Royal Auxiliary Air Force, Air Training Corps and other smaller units and contractors who remained at Leuchars after the transition. Leuchars Station has facilities that can be hired by the military and village community. If you are looking for somewhere to hold a party or any other event please contact the Station Support Unit by e-mail: LEU-Stn-Mailbox@mod.uk or visit the HIVE in the Community Centre for further details.